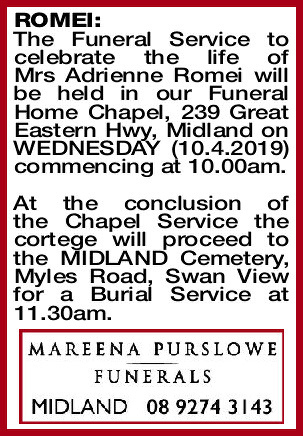 The Funeral Service to celebrate the life of Mrs Adrienne Romei will be held in our Funeral Home Chapel, 239 Great Eastern Hwy, Midland on WEDNESDAY (10.4.2019) commencing at 10.00am. At the conclusion of the Chapel Service the cortege will proceed to the MIDLAND Cemetery, Myles Road, Swan View for a Burial Service at 11.30am. 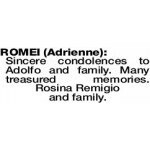 ROMEI ADRIENNE Adrienne Carroll Romei Dearly loved wife of Adolfo. 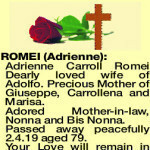 Precious Mother of Giuseppe, Carrollena and Marisa. 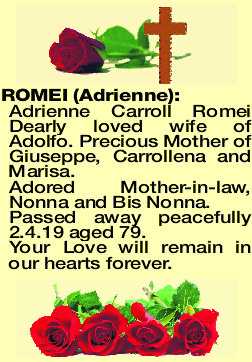 Adored Mother-in-law, Nonna and Bis Nonna. Passed away peacefully 2.4.19 aged 79. Your Love will remain in our hearts forever. 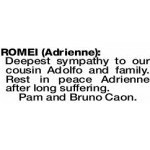 ROMEI ADRIENNE Sincere condolences to Adolfo and family. Many treasured memories. Rosina Remigio and family. 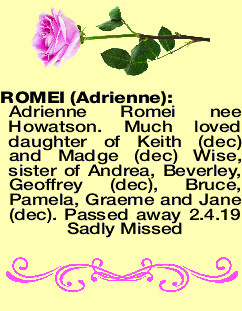 Deepest sympathy to our dear friend Adolfo and heartfelt sympathy to all the family on the loss of your loved one. ROMEI ADRIENNE Deepest sympathy to Adolfo and family. We will remember the good times. 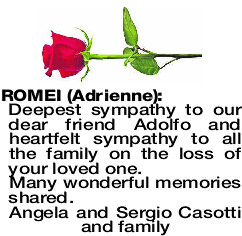 Deepest sympathy to our cousin Adolfo and family. 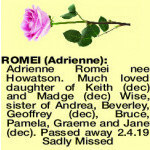 Rest in peace Adrienne after long suffering.